Sometimes I think there is something wrong with me… I can’t seem to just use a large piece of fabric for my quilt backs. Why? 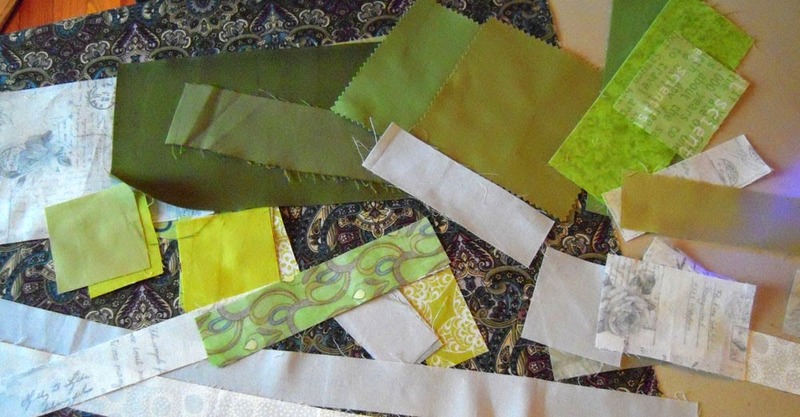 Because I always have left-over scraps from the front, that I just don’t want to use for something else – I’m usually ‘done’ with certain fabrics after using them in a quilt. Of course, using scraps to piece a back ALWAYS takes me longer than making the front! It becomes an improv piece as I never know exactly how these pieces will take shape. 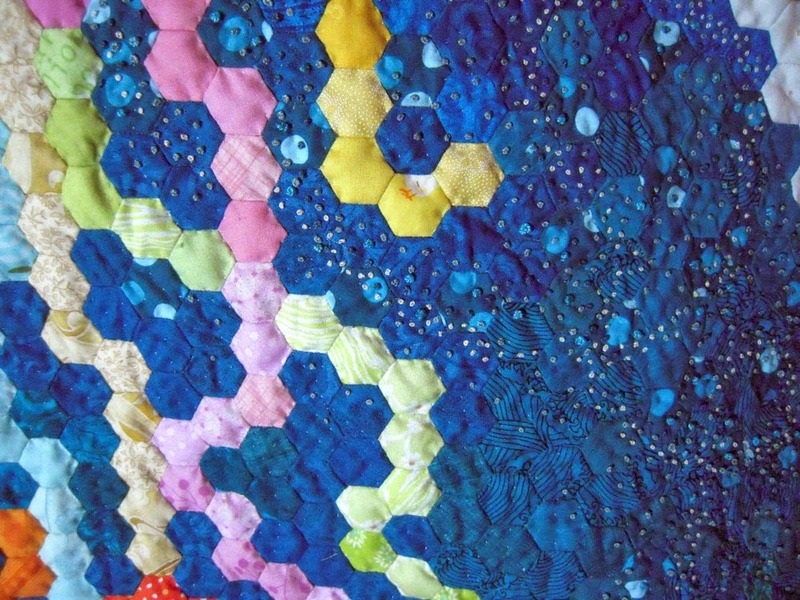 I feel very gratified for using up all my scraps – if something is too small for the back I cut it into 1.5″ squares for my hexies… and even smaller pieces are now saved for pet beds. The best part is ending up with a two-sided quilt! 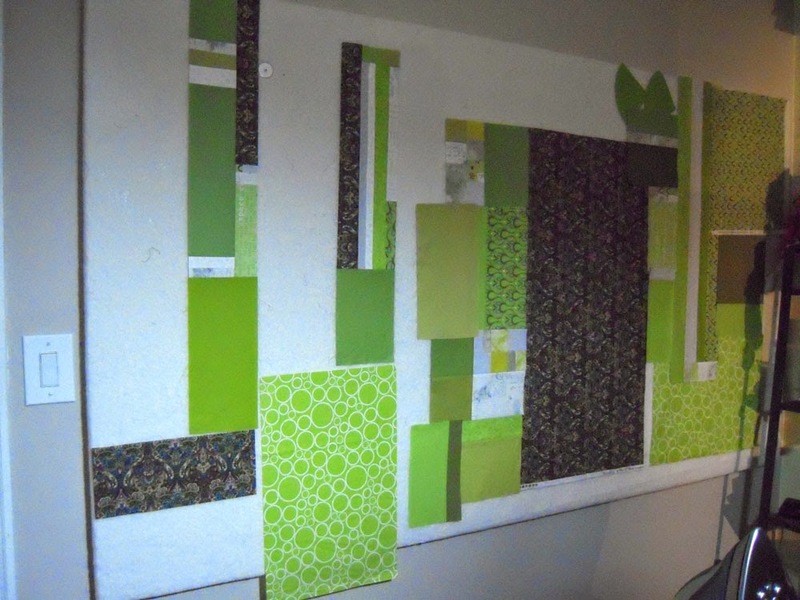 One side planned, the other improv – using the same fabrics. To me, it’s really neat to see the same fabrics used so differently. Unfortunately, I won’t have the Green Cross Quilt finished for the PMQG meeting tomorrow… but I will be bringing the Jellyfish! I love sharing my quilts with my guild – everyone is so supportive, even after seeing pictures and hearing about it all the time since last year! I was just telling a friend recently how I never used to finish anything. Finishing a big project like this is so fulfilling to me – and says a lot about how far I’ve come in my life. I’m so happy to share it with such amazingly creative people! Tell me more about saving small pieces for pet beds–personal or organizational?if the latter, requirements? Just personal for the pet beds, I got the idea from Sam Hunter… just put all your scraps in a bag till there's enough to fill a pillow case or some other made thing to make a bed out of. My kitty will love it (eventually)! See you at the meeting!